What an amazing piece of artistry in that thumbnail! Oh, and the video is pretty good, too. Got to Race 11 out of 16 on the final level of Michael Andretti's World GP tonight. Gained up a small lead and then lost much of it. I'm past 2 of the levels I was most worried about though so that's a silver lining. Hoping to finally finish this up tomorrow. The dino seems to agree since it's giving a thumbs up! 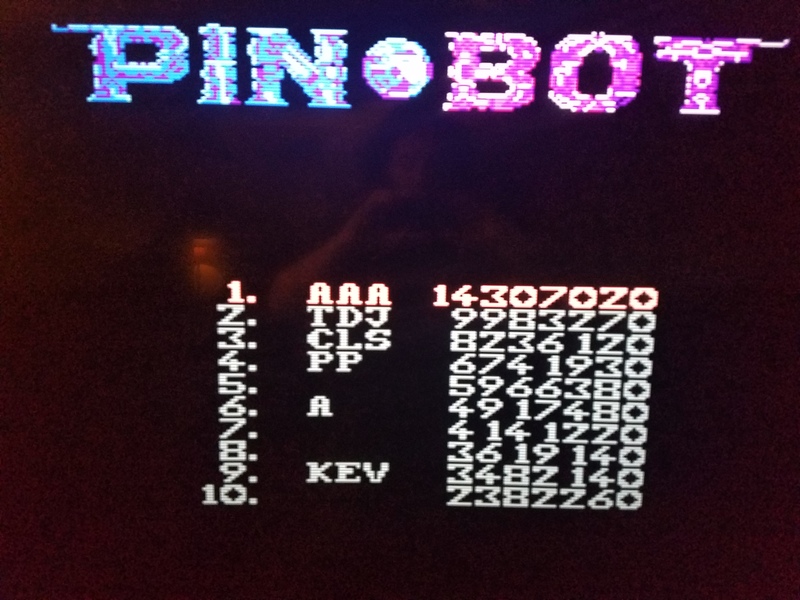 I recently discovered that I really like pinball games, so I've been working on Pin-Bot for a little while now. After dozens of tries that include a couple of heartbreaking scores of just under the 10 million, I was able to pull off a great run and shattered the high score. I enjoyed the game and found it very addicting, but it was also very frustrating. I don't know if this is common with pinball games (or actual pinball), but I felt like there were many times when there was nothing I could do to stop a ball from being lost, and things could go so bad so quickly that it actually felt like the game was actively trying to make me lose. Seemed a bit cheap at times, but I still enjoyed it and plan on attempting the remaining NES pinball games. And yes, those are my actual initials. Checking in here, I still intend to go after The Jetsons but I've been having some health issues lately. Had the nastiest flu back in March and now I'm dealing with some retinal lesions caused by said flu (which are healing thankfully!). My vision isn't the best right now but once it improves some more I'll get back on it! Sorry to hear about your health difficulties, but glad to hear you're on the mend!